Favorite Thanksgiving food? Mashed Potatoes (or as we call them in my family: Mashed-for-Taylors). Favorite Thanksgiving tradition? Getting together with a number of friends and family the day after thanksgiving for a giant kickball tournament (Kids vs. Adults, and I’m still young enough to be considered for the kid team!). Strange Thanksgiving memory? The year my grandmother kept praying for God to take care of the people in Siberia, when she really meant to say Syria, and none of us could figure out why she was so adamant with her prayers. Favorite Thanksgiving pastime? Standing outside with my Dad in the cold while he prepares to fry one of our turkeys. I love Christmas and I love Easter, but Thanksgiving is equally wonderful in my opinion. There is just something so special about all the traditions coming into focus with incredible people on an annual basis. I look forward to this week with eager anticipation because I will get to see family for the first time in a long time, I will get to laugh with my sisters at the expense of our parents, and I will get to enjoy my mother’s incredible cooking. Of all the Thanksgiving traditions, my favorite is the moment after the prayer, once we have finally sat down in our seats, when I have the privilege of inviting everyone to go around the table and share what they are most thankful for this year. At our house, tears are always inevitable. During the time of thankfulness I witness my cousins maturing to an age when they can truly appreciate some of the blessings in their life, I witness family members break down in the recognition of how wonderful their lives really are, and I witness friends and acquaintances truly become part of the family. Expressing our thankfulness at the table is, without a doubt, my favorite moment during the Thanksgiving experience because you get to share in God’s glory made manifest in the lives of those gathered together. Over the last few months we have had too many funerals at St. John’s. Too many times have I stood in the pulpit and proclaimed the life, death, and promised resurrection of someone in our community while friends and family wept in the pews. For every funeral I have used the words from Paul: “But thanks be to God, who gives us the victory through our Lord Jesus Christ.” Even in the midst of horrendous suffering and loss we give thanks to God for the gift of those persons we have lost, we give thanks to God for His continual and abiding presence, and we give thanks to God for the great victory over death through Jesus Christ. No matter who we are and no matter where we are, we have something to be thankful for this year. It might not be a new job, or a loving spouse. It might not be a lucrative career, or perfect children. 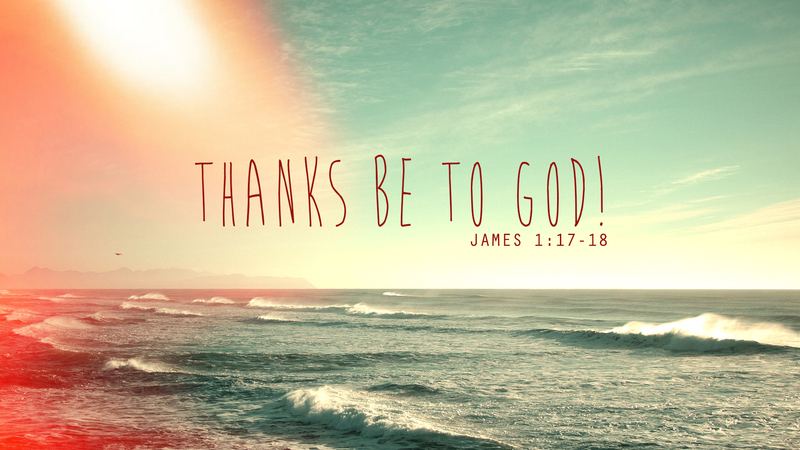 But there is one thing that we can all be thankful for: the gift of God in Christ. May God’s grace and presence be with all of you this week as we give thanks back to God for our blessings.